Kent is the largest library authority in the country, with 99 libraries serving a population of ~1.5m. 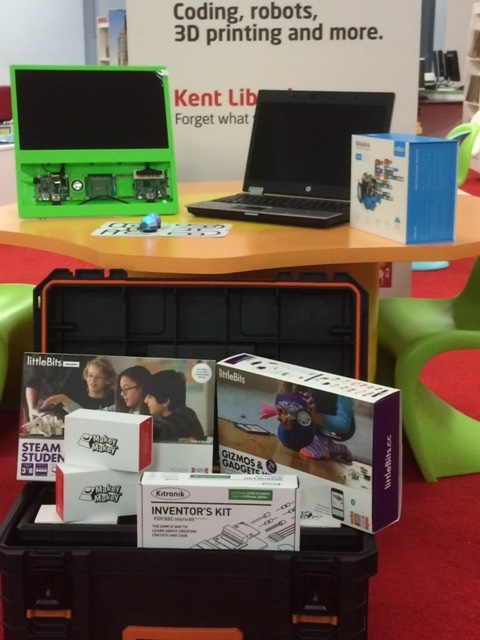 Recognising that digital skill development is a vital area for Kent to grasp, our first foray into digital-themed clubs began in early 2016 with Code Club at Gravesend library. Within a few weeks of promotion, the club was oversubscribed and we had a waiting list of children eager to attend, showing how much appetite there was for more clubs like this. Learning gathered from this first code club helped Kent plan for the future and develop how to manage these clubs; what worked well and what didn’t, and specific areas where we needed to upskill staff. All of these lessons would come to inform our future strategies and plans for digital clubs in Kent. Kent successfully bid for funding from the Libraries: Opportunities for Everyone (LOFE) innovation fund in April 2017 and, by June, I was seconded to the role of Project Manager. 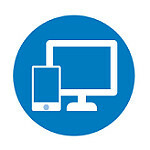 The bid was to set up 5 digital clubs in locations of deprivation in Kent, with the aim to tackle disadvantage amongst children (ages 8-11) by providing access to technology that they might not otherwise have. The clubs would also support development of digital and foundational skills, eg. problem solving, through use of Code Clubs. To begin with, we started networking with other Makerspaces through the Libraries Innovators Network. This was immensely important and informative, and if I had to offer a single piece of advice to anyone looking to start something similar, it would be to not neglect this stage. Seeing what had worked elsewhere, and equally as important what had not worked, helped us to solidify our own ideas. Don’t make things harder for yourself by trying to re-invent the wheel. We also began working with Artefacto, who provide consultancy, training and workshops on Digital and Makerspace equipment for galleries, libraries, archives and museums. This partnership has been instrumental for the project. 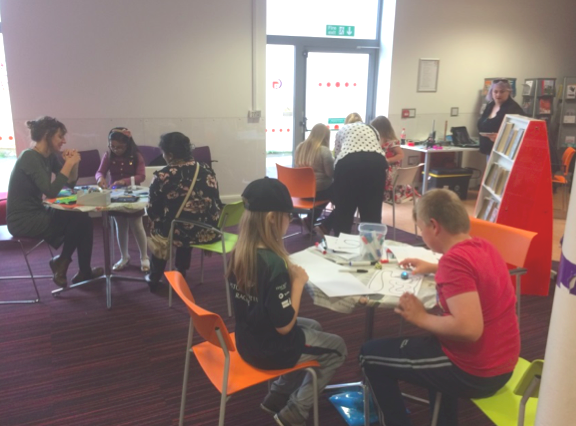 Although we had some awareness of what technologies were out there and a vision for how we wanted the clubs to work, their expert knowledge and experience of setting up makerspaces really helped us to further refine our ideas. They also worked with us to develop and procure what would become our Makercart - a portable cart containing all of the equipment that would be used in the Dens. The kit includes things like a 3D Printer, LittleBits, micro:bits, Raspberry Pi’s, Ozobots, mBots, and Paper Circuits. We identified Gravesend, Sheerness, Ashford, Swanley and Newington Libraries as suitable sites for these clubs. As of the end of November 2017, the Gravesend and Sheerness Digital Dens are up and running and Ashford’s club is planned to open mid-December. Swanley and Newington have their training and promotional events scheduled between January – February 2018, and should be open by March 2018. Each site has a promotional event prior to the official launch. This is a half-day event delivered by Artefacto and local staff which shows off some of the equipment in the Makercart and allows children, their families, and even staff to come and see what the club is all about. Initially both Gravesend and Sheerness had to start with staff leading the sessions due to a lack of any volunteers. This did prove tricky at times, but it was important for establishing the Digital Dens that sessions did run, and thus is definitely something you should consider if you have the capacity to do so. Even when volunteer applications began to come through for these sites, it generally takes several weeks for the induction process to complete due to the DBS check and then delivering training. Each session has capacity for around 10-12 children. Gravesend is about to open a second session per week, and Ashford is planning for the same. The expectation is to have each club running at least two sessions a week, but as these clubs are primarily run by volunteers, this is obviously dependent on their availability. Ashford have over 50 children signed up for their waiting list. Although we are not able to cater to all of these children in a single group, we are planning to run multiple sessions a week where possible and have special “events” which anyone can join in, eg. around holidays. Every promotional event has gone really well and sees a greater number of children and families visiting the library on the day than otherwise expected. We have had some great success with volunteers, from ex-programmers familiar with some of the equipment, to people who have taught coding in schools. 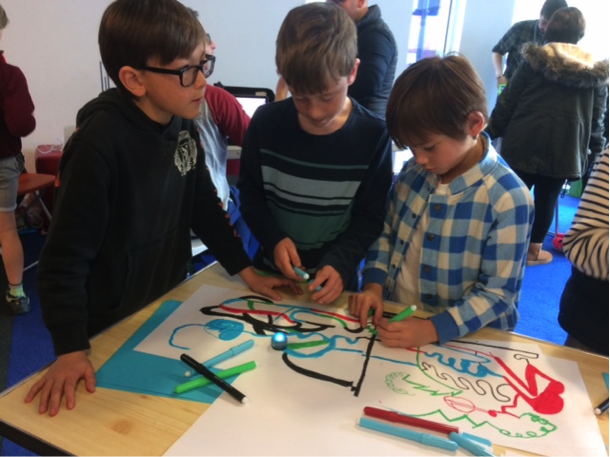 It warms the heart to see the children’s confidence in coding develop, to the point that, even after just a few sessions, problem solving suddenly becomes an activity they perform as a group instead of just asking the volunteer for help. I’d count that as a success! Not all of our staff have the same level of experience or interest in technology and coding, and it’s important to recognise this and think about ways you can get staff on-board with your project as early as possible. Having an interest is far more important than having experience – training can always be delivered. As mentioned previously, although we have had successes with volunteers, volunteer recruitment has also been one of the greater challenges in some areas. When planning your project, consider if you have capacity to start with staff if needed – it can be easier to attract volunteers when the club is already running. 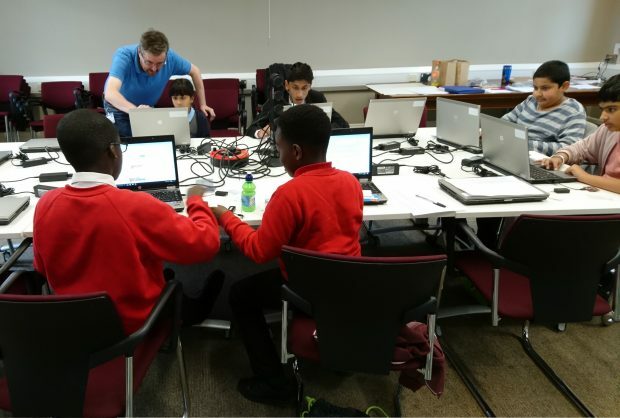 By running Code Club alongside sessions using the equipment, each Den has plenty of content to work with and the volunteers and staff leading in each area have been given a great deal of freedom to choose how they develop their club. We specifically wanted to give the children a sense of ownership over the club that they attend, and enable them to guide the course the club takes through their feedback. This gives each club a sense of individuality – one might focus on coding while another might focus on 3D printing. Training on all of the equipment and an introduction to coding has been provided to staff and current volunteers, who in turn can pass on that knowledge to anyone who joins at a later date. Although the funding needs to be fully spent by March 2018, the clubs have been set up so they continue growing in to the future.